Over the weekend (December 6-7, 2014) we received reports of the reinforcement of local insurgent formations, and formations of “camouflaged” Russian forces stationed on the occupied Donbas territory, which incurred losses over the last few days. The reinforcements are arriving mainly in the form of Russian mercenaries and contract soldiers of the Russian army, deployed from composite task groups stationed at the border. The artillery component of these gang formations and Russian troop formations is being reinforced as well. Over the last two days, at least 2 cannon artillery batteries (152-mm MCTA-B howitzers, 122-mm D-30 howitzers) arrived in the occupied areas of Donbas. Ammunition and other supplies are being delivered from Russia and accumulated at increasing rates. • 107th brigade of the Internal Troops of the Russian MIA. Due to the losses incurred by the composite battalion task group of the Central Military District of the Russian Federation which was formed of members of two motorized infantry brigades of that district, this battalion task group was moved from the front positions near Dokuchajevsk to the support echelon in the Starobesheve – Kuteinykove area, for reinforcement and replenishment. Total losses of this battalion task group (permanent and temporary casualties) have reached a quarter of its original staff. In a number of Donbas towns (Torez, Rovenky, Snizhne, Krasnyi Luch), terrorists continue “enlistment” to the so-called “Army of Novorussia.” These “mobilization arrangements” are carried out by armed insurgents in a number of companies and mines in the region, on a compulsory basis. The total number of local residents “mobilized” in this manner over the last few days was up to 30 persons in total. On Saturday, December 6, the enemy attempted to mount an offensive against the positions of Ukrainian troops to the south of Avdiivka. The attempted offensive was accompanied with cannon artillery fire. After two consecutive strikes by Ukrainian GRAD multiple rocket launcher systems, the enemy first stopped the attack, and then retreated to the area of Yasynuvata. Fierce battles continued around the Donetsk Airport. The old terminal building has been destroyed almost completely. As of Sunday, December 7, this building was in the no-man’s land, being a live fire zone. On Sunday night, the enemy delivered another powerful artillery strike on the positions of the “cyborgs” [defenders of the airport]. The Ukrainian artillery made a retaliatory strike on the enemy’s original positions near Putilovka and in the Kuibyshev district of Donetsk. 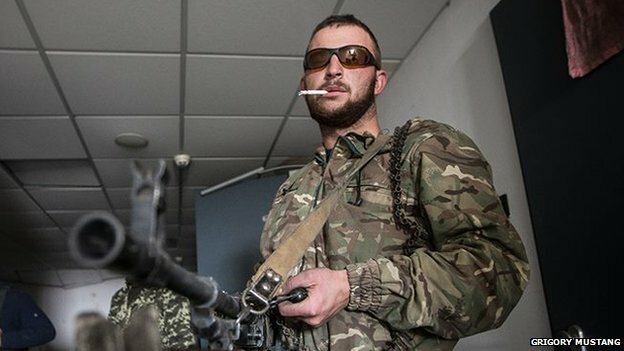 One of the “cyborg” defenders of the Donetsk Airport. 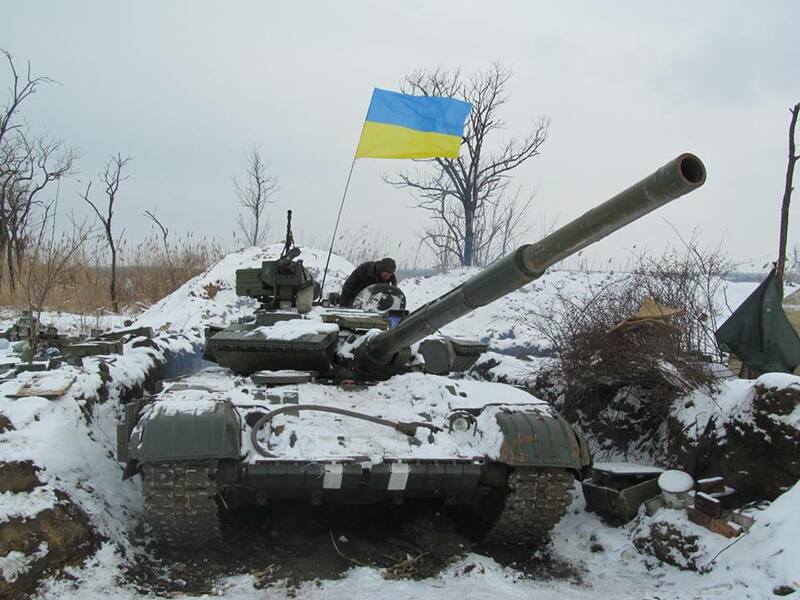 Counter-battery duels continued during the weekend near Volnovakha. Ultimately, Ukrainian artillery strikes forced the enemy to leave their front firing positions and pull their artillery units back, behind Olenivka and Dokuchajevsk. In the area of Trokhizbenka, Schastya, and Stanytsia Luhanska, the enemy continues concentrated firing strikes on the positions of Ukrainian troops. Ukrainian forces continue holding the bridge near Schastya. The enemy mainly uses cannon artillery (we received reports of a minimum of 3 active batteries, one of them self-propelled), multiple rocket launching systems, and mortars. The enemy continues heavy shelling of Debaltseve. Over the last two days, we received reports of heavy cannon and rocket artillery fire from the direction of Vuhlehirsk, Makiivka, and Chornukhyne. Mortar and howitzer fire is coming down on the village of Nikishyne. In Horlivka, there are persistent rumors about an “SBU [Security Service of Ukraine] liquidation team” operating in the city. The rumors are circulated among the insurgents of Bezler [Ihor Bezler, codename “Bes” (“Demon”)] included in the new gang formation, the so-called “Army of Novorussia.” The insurgents believe that the database containing information about the city “militia” ended up in the hands of the SBU, and now, members of the Ukrainian special service planted on the occupied territory are methodically working to track down or liquidate the remaining “Bes’ fighters” in the city. Meanwhile, during the past week, three former commanders of Bezler’s gang were found showing obvious signs of violent death, and at least two more have gone missing.